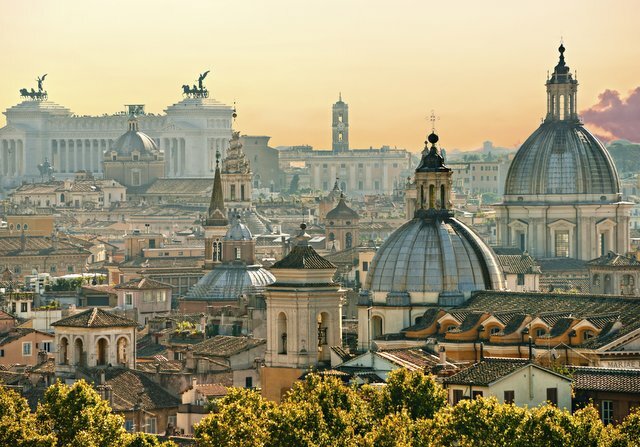 One of the most famed and beautiful cities in the world, Rome is Italy’s cosmopolitan capital city, and brimming with exciting things to do. Land in style at Rome Ciampino airport on your private jet charter, and prepare yourself to be bombarded by some of the most amazing sights, sounds and smells! Engage with the hustle and bustle that Rome offers, feel the waves of the summer sun wash across your face as you meander through the streets. The glowing sunshine illuminates the deep ochre buildings, and light terracotta styles. First and foremost, you must decide where your ideal destinations are, as Rome offers a myriad of exciting and entertaining places. Of course, the initial place that every true tourist must visit is the Coliseum, located in the heart of Rome, this elliptical amphitheatre is a prominent landmark. The concrete and stone construction, not only houses a long history, but is the one of the greatest feats of ancient architecture, and is the largest amphitheatre ever built. The Pantheon, another must see, is an imposing structure with large granite Corinthian columns, looming over the Piazza della Rotonda. The most well preserved and highly significant Roman temple, this magnificent architecture is dedicated to all the gods of Pagan Rome. Walk around and appreciate the sheer enormity of the 43 metre high dome, which prior to the Florence Cathedral construction in 1436, was the largest dome in the world! Another absolutely wonderful monument, is St Peter’s Basilica. A place you will have seen on the news and where the Pope has appeared many times upon the balcony. Be warned, they enforce a strict dress code, so ensure you are not wearing shorts or a mini skirt, and have no uncovered shoulders! Be mindful and respectful of this Late Renaissance church that looms large within the walls of the Vatican City. There is a vast underground graveyard, hauntingly beautiful; it houses the tombs of numerous departed popes. Once you have seen St Peter’s from the regular tourist perspective, head to Via Piccolomini, a residential street that provides the onlooker with a fresh view of St Peter’s. Stand at the end of it, further from the Basilica, and witness St Peter’s appearing gargantuan. Interestingly, if you drive down this street, and speed along towards St Peter’s, it appears smaller and smaller, the closer you get! If, after eagerly devouring Rome’s antiquity, you are ready to delight in some frivolous shopping and treat yourself, follow our recommendations and discover more of Rome’s heritage and shop till you drop! For a place brimming with luxury and exclusivity, take a turn down the side road Via Condotti, just off Via dela Corso. Via Condotti is a famed shopping street, home to names such as Prada and Gucci, and leads to another beautiful location, Piazza di Spagna, the location of the Spanish steps. Dominating the top of the 135 steps is the Trinita dei Monti church, which is well worth a visit. Dal Bolognese, a famed restaurant, which has served elite clientele with names such as Kim and Kanye. It is one of the finest restaurants in all of Rome, and will cater to your every Italian whim and delight. Situated in a corner that is bursting with history, your palette will forget the Italian food you thought you knew as you indulge in fresh, homemade pasta and other local delicacies. Villa Borghese is home to a club known as the Art Café; you will be greeted by decadent, traditional-themed décor that offers live acts, dance anthems and an exclusive underground vibe. Although, a touch tourist focused, it has seen many celebrities; you can buy a table with drinks to flow throughout the night.